Maurice Frederick Codner (1888–1958), portrait painter, was born in Stoke Newington, London, 1888, the third son of William Squires Codner, iron merchant, of Abbotskerswell, Devon, and his wife, Ada Mary Payne. Codner was educated at the Stationers' Company School, but the details of his early career are not recorded. He was educated at the Colchester School of Art. He married in 1913. Codner served in WWI, after which he established himself as a professional artist of the first rank in the UK. 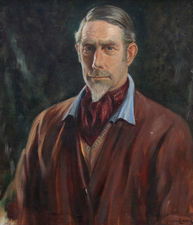 He exhibited often at the Royal Academy, London, and in the Paris Salon (where he won honorary mention 1938, and a Silver Medal 1954). He was especially successful with portraits; among his subjects were King George VI (1951), Queen Elizabeth II and the Queen Mother (1952). A striking portrait of the singer Kathleen Ferrier (1946) is in the National Portrait Gallery, London.